I could probably tell you a thousand reasons (things/people/situations) that make/made me happy. But somehow I feel like it's always just for a fleeting moment. Eating breakfast food at midnight. Being appreciated. Watching movies that hit the spot. Seeing old friends. Meeting my favorite band in the whole world. Sinking my teeth on that cupcake I've been craving for the longest time. Waking up to weekend music. Having dinner with my family. Finding and staying at a job I love. A surprise visit from my lover. Getting a new tattoo. Conversations with my best friend about life and love in the wee hours of the morning. Meeting the most unexpected type of person. No traffic Fridays. Chocolate. Internet. Roadtrips. Waking up and realizing you're in some other place. All of those things make me happy. It comes in all shapes and sizes, impacting my life in the littlest and biggest ways possible. But I always felt like I experience happiness in brief instances only. It's like it's just passing by. Always just encapsulated in memories that's later archived in your brain, free for you to remember whenever you're feeling blue. It's never a state of mind/being for long periods of time. It's like little pockets of euphoric instances to help you get through life. I feel like it's always in bits and pieces. If you ask me if I'm happy, my honest answer would be, "I'm okay." But if you ask me later after I've played with my dog whom I haven't seen for 2 weeks, I would probably answer, "Yes, I am." If you've asked me 3 days ago, I would've probably said no. Maybe that's enough. Maybe that's all it takes--small servings of joy and contentment to last you through this lifetime. Now that I thought about it, I've never really met anyone that's been perpetually happy. Yeah, happiness is such a fuzzy concept. This post is in response to Truth Thursdays' current prompt, Happiness Is. Truth Thursdays exists to connect people through writing. To initiate something honest, thoughtful and meaningful. 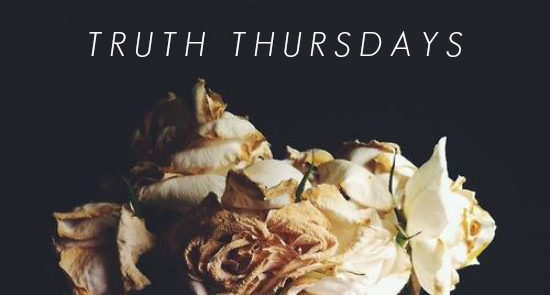 If you want to know more about Truth Thursdays and how to be a part of it, read here.